Are you planning to visit Crete this year and find it difficult to choose the ideal destination for you? That is quite reasonable, due to the fact that Crete is a big island with many beauties to explore and many popular Crete destinations to choose for your stay. Either you are looking for a seaside tourist resort, a quiet fishing village or a mountainous area, Crete is the best place to find whatever you are looking for! 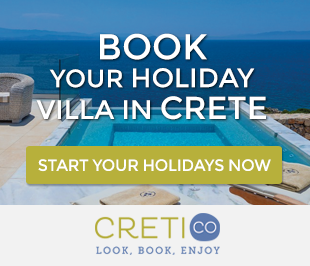 In order for us to help you make your decision, we have created a list with the best Crete destinations, where you will experience really dreamy holidays. In our current post, you will find a short description about each of the destinations, as well as links leading to related posts and the search page with villas in each of the regions. Planning your next holidays? Enjoy the amazing Island of Crete with a Holiday Crete Villa. Chania is considered to be as one of the most famous Crete destinations, as it is visited by even more travelers every year. 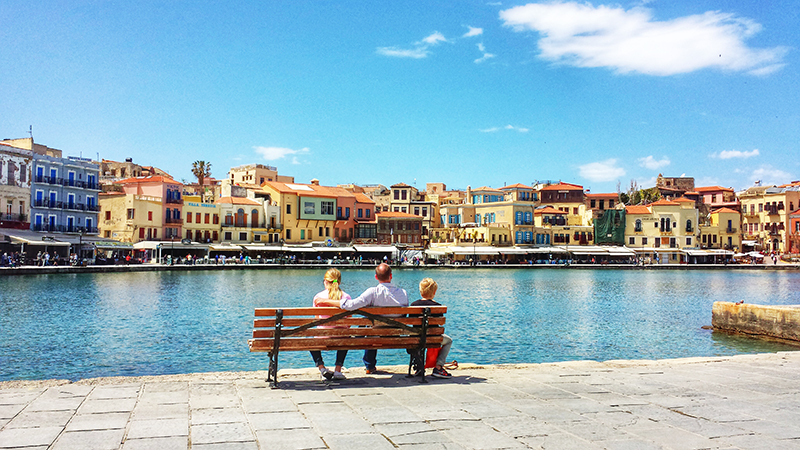 Chania is a city full of natural beauty, history, memories and culture. It is the place where visitors will experience nature in all its glory and will see impressive sights. For many visitors, is considered as the most beautiful city of Crete. The jewel of the city is its Old Town with the beautiful old Venetian harbor, ideal place for romantic walks. In Chania, you will also find various restaurants, cafes, bars and clubs, playgrounds, e.t.c. 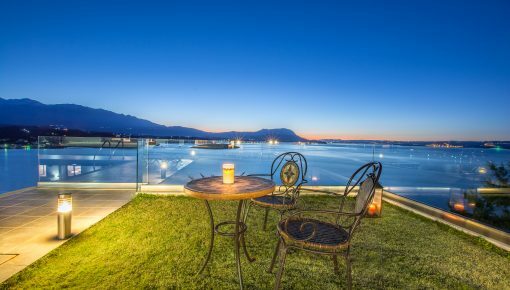 As for accommodation, there is a variety of holiday villas in Chania for you to choose from. You will certainly find the villa of your dreams! Rethymno combines the aroma of a past era with the modern aspect of a city that has so many things to offer to its guests! If you go for a walk on the streets of the Old Renaissance Town of Rethymno, you will feel a special blend that creates a unique atmosphere. The nightlife in Rethymno ranges from big clubs and bars on the coastal road of the Old Town, to traditional taverns with live music and delicious traditional delicacies. Close to the city of Rethymno, you will find really nice holiday villas with traditional style and views of the Cretan nature. Elouhttps://creti.co/search/elounda-lasithi-crete/nda is considered as the most cosmopolitan resort of Crete. It features some of the most luxurious villas in Crete and Greece, providing high quality services. 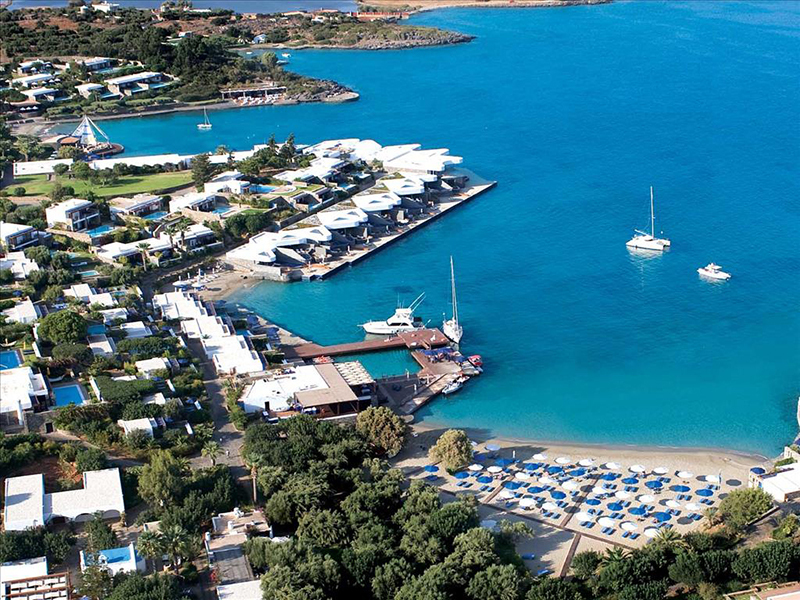 Elounda, in addition to its cosmopolitan character, offers a lot of natural beauties and wonderful beaches. If you choose Elounda, do not miss a one-day trip to Spinalonga island, the “Island of the Leppers” as the locals call it. Also, a tour on the Happy Train of Elounda, will allow you to get a better taste of the city! Hersonissos is currently considered as the most developed tourist resort in Crete, due to the high quality services provided and the various attractions !It is a place to fulfill all your expectations. 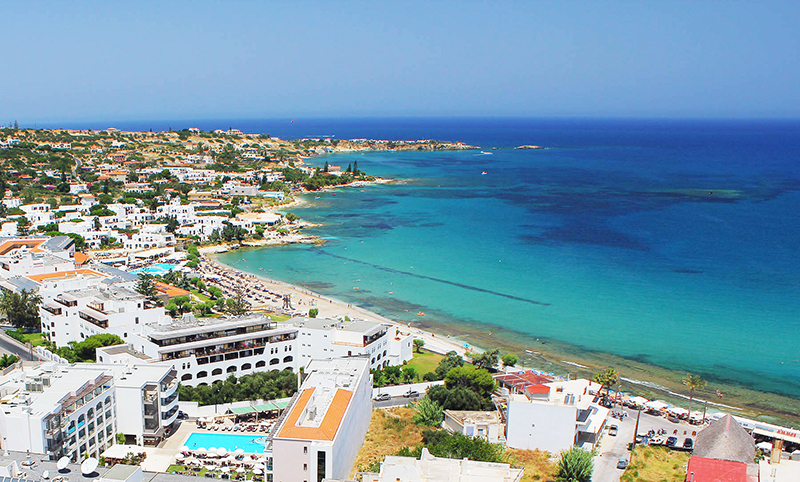 Chersonissos is famous for its nightlife and large sandy beaches. 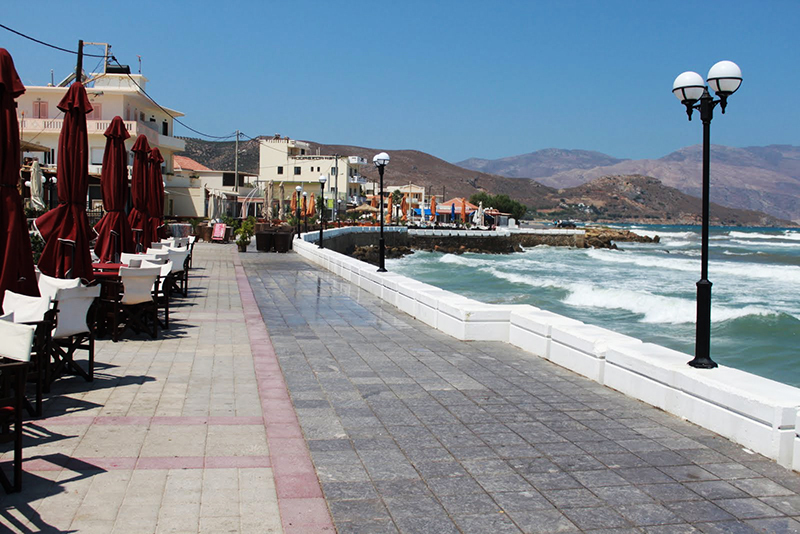 In Hersonissos you can relax and sunbathe, and take day trips to other parts of Crete. Do not miss a visit to the Cretaquarium “Thalassocosmos”, which is close to Hersonissos. It will be a really exciting experience for your kids! 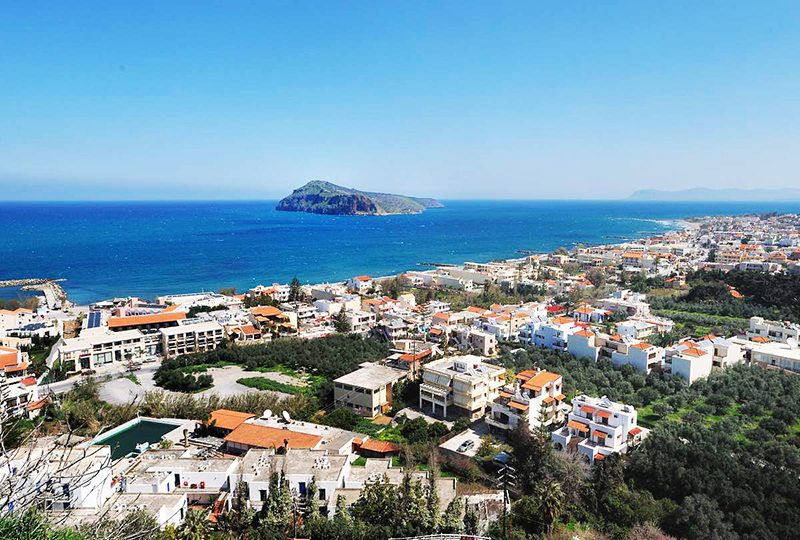 Holiday accommodation in Hersonissos includes many types of homes, from the most luxury ones to the most traditional ones. 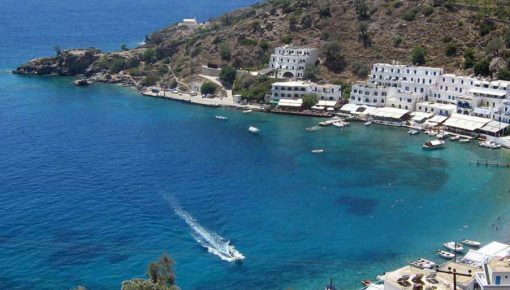 Kissamos, or else Kasteli, is located in the northwest coast of Crete. In Kissamos, visitors can find everything they need for their holidays. Several shops, restaurants, cafes and bars are located in Kasteli to serve everyone’s needs. In the afternoon, the coastal promenade of Kasteli is offered for romantic evening walks. A big advantage of booking a holiday villa in Kissamos, is that this place is the nearest organized resort very close to three of the best Crete beaches: Balos, Falassarna and Elafonisi. Agios Nikolaos (St. Nicholas) in Lasithi, features one of the most impressive landscapes in Crete and Greece. 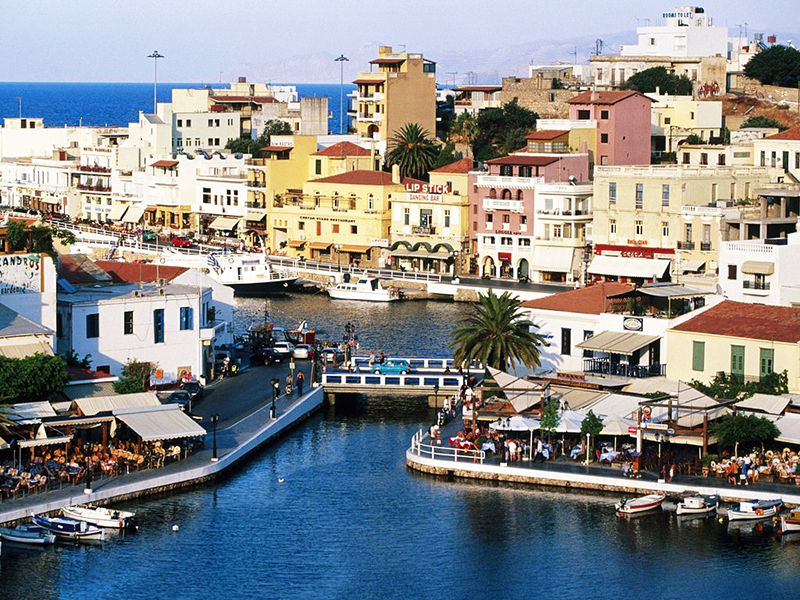 The center of Agios Nikolaos is really picturesque and ideal for romantic walks! The surrounding area of the city is very beautiful and you will find many beaches to enjoy close to it! The landmark of the city is a small lake, known as Voulismeni that is located in the city center. 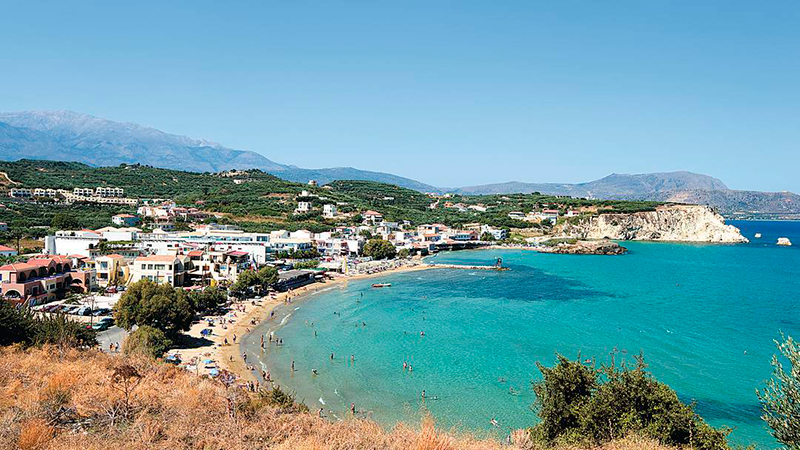 Thousands of tourists visit Agios Nikolaos every year to enjoy the beautiful scenery. As for accommodation, beautiful family villas in Agios Nikolaos and close to it are offered to you. Akrotiri region, in Chania, is high in our list with the most popular Crete destinations. Akrotiri is a peninsula near the east suburbs of Chania, with beautiful beaches and impressive monasteries that were built centuries ago. In addition to its proximity to the city of Chania, another advantage of that region is the International Airport of Chania, located there. We would recommend you to read our guide with holiday homes, beaches and places to visit in Akrotiri. 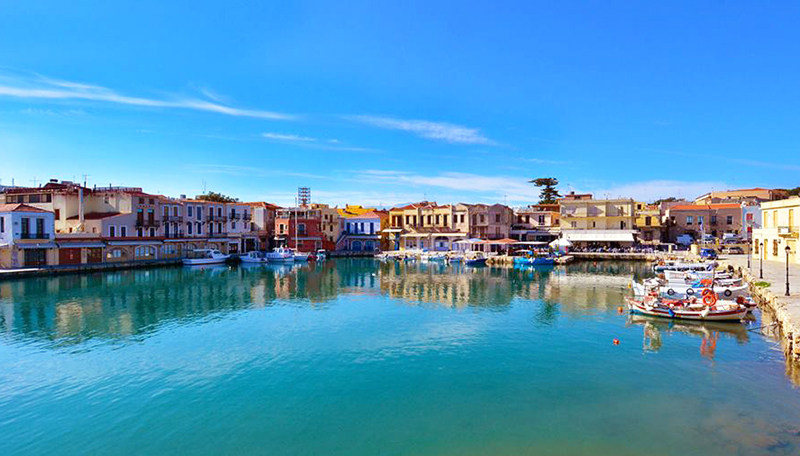 Almyrida is a picturesque fishing village and seaside resort in the east of Chania Prefecture. Almyrida is a great place for family holidays, but also holidays with friends! It has a number of fish restaurants and traditional taverns serving local recipes made with fresh products. For the youth, Almyrida offers also quite many options for nightlife entertainment, such as cafes converted into cocktail bars at night. Also, if you choose to stay in this area, you will have the chance to explore the surrounding villages such as Plaka and Kalyves. There is a variety of holiday villas in Almyrida, offering breathtaking views to Souda, which will leave you speechless. Matala is a village in South Heraklion, Crete, near Phestos, the second most important Minoan palace in Crete. 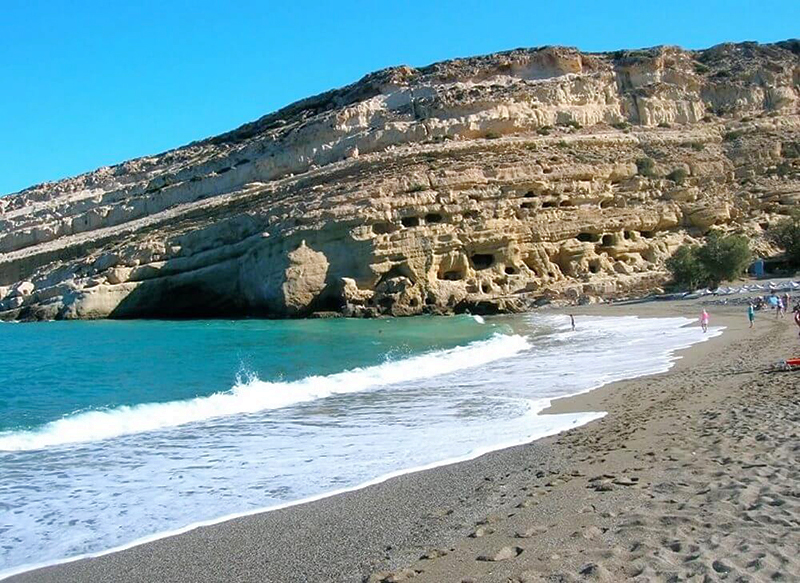 It was one of the most famous Crete destinations, in 1960s, when hippies arrived here from around the world to live in the famous caves of Matala beach. This area is ideal for those who want to spend their holidays, by visiting beautiful beaches, great archaeological sites and many villages which, still, maintain their traditional color. You will find many traditional holiday homes in Matala to spend your holidays. Agia Marina is located 8 km. west of Chania city. 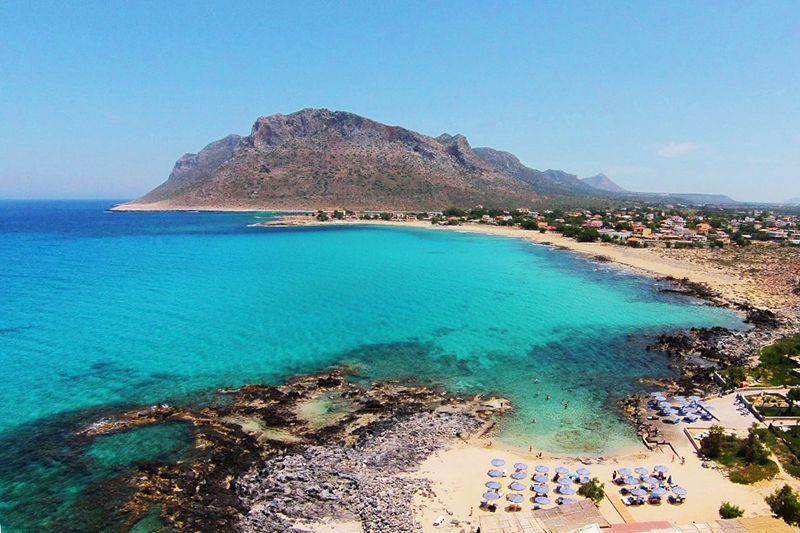 It is the most known seaside resort of west Crete and one of the most popular Crete destinations. It features a long sandy beach, 2.5 km, offering numerable facilities. The golden sand of the beach and the trees along the seafront create an exotic scenery. There are many restaurants and taverns in Agia Marina, where you may taste traditional dishes and international cuisine. Agia Marina offers also many options for nightlife with many clubs, bars and beach bars as well as many options for accommodation. Posted on 03 Nov 2016 This entry was posted in Featured Posts, Holidays in Crete.